San Diego Comic-Con 2016's begins with this evening’s preview night, when many of the most desirable collectible exclusives will disappear. 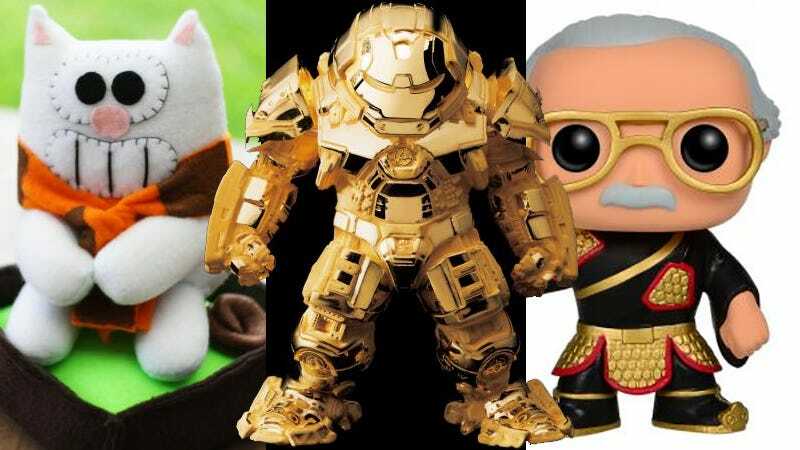 Then there are there are the exclusives that’ll likely make it through to Sunday, like 24 karat gold Iron Man and Guan Yu Stan Lee. While everyone else is lining up at Lego, Hasbro and DC Collectibles for a chance to pick up some rare things, other booths will be wide open, eagerly waiting to trade your money for the things they brought with them. Check out the ten below, and then flip through the official list and add your own in the comments. This is the Comic-Con buy for anyone who has ever lusted after an exclusive toy only be stymied by the arcane rituals necessary to procure it. For all of those who’d rather not waste hours of the convention waiting in line for a chance to get the rare thing they wanted. Exclusive Man is there hero. Is it an empty plastic bubble, or is it concentrated hopes and dreams? I’m going with empty plastic bubble. Beast Kingdom proudly presents the world’s first 24 karat gold collectible Iron Man figure. Standing three inches tall, the only this version of Iron Man MK 42 is missing is a loop at the lop to affix a chain. Limited to 200 pieces, it’s sure to bring in plenty from one of those gold-to-cash mail-in services once you realize the horrible mistakes you’ve made. The delusions of a great man in toy form. This is Stan Lee dressed as Chinese general Guan Yu. He’s one of the best-known Chinese military figures in history, renowned to the point of deification and still worshipped in China to this day. Stan Lee is kind of like that, only completely not. Just a whole bunch of Archer junk. That’s Archer’s enormous package. Are we still doing phrasing? This is a cat shitting in a box. A handmade cat shitting in a box. Surely there is someone on your Christmas shopping list that could use a handmade cat shitting in a box. I’d get one, but I’m not there. This makes absolutely perfect sense, and that frightens me, almost as much as knowing exactly what Batman needs to remedy this situation. If you roll up on a back alley HeroClix game with this figure, you automatically win. Or you get gutted and the other folks win. Remember libraries? Sitting in them for hours, researching ways to deal with the occult forces taking over your small town, or bonding with a group of fellow students that aren’t like you at all but actually, deep-down inside, are just like you? I don’t. It’s been decades since I’ve been in a library, consuming most of my books electronically these days. Still, lovely card. Reminds me of libraries. Legacy of the Beast Iron Maiden 10-Doh! I love a figure line that harnesses the power of gaming nostalgia. There’s just something weird about combining a game cartridge from the ‘80s with a mobile game from a month ago based on music I was really into in the ‘90s. I don’t know how to feel. “Did you get me anything at the show, Daddy?” “As a matter of fact...” There is an entire line of Teddy Scares, lifeless stuffed animals discarded by their owners only to wake up in a trash dump as sentient terrors. Imagine growing up with one of these on your bedroom bookshelf. Waiting. Watching. Did it just move? Probably. It’s not just that Sonic the Hedgehog and Hello Kitty are teaming up in this shiny plush creation. It’s that Hello Kitty seems to have . . . I am going to call it a surgical scar. You’ll probably come up with something far worse.